Seeing the world with a furry co-pilot is one of the best perks of this lifestyle. But full-time RVing with pets also requires exceptional patience and understanding. Even the biggest animal lover discovers that living with a dog or cat in a small space is overwhelming and frustrating at times. Knowing how to start RVing with dogs and cats is essential for their health and happiness. Here are some examples. Pets on the road is more fun (and sometimes frustrating!). If you think your life revolved around your animal before, you ain’t seen nothing yet. Whether you have a cat, dog, chimpanzee or other animal on-board, their needs come first. Any decisions about where my husband and I go and what we do always depend on the needs of our German Shepherd, Wyatt. For example, he hates hot weather so we tend to choose itineraries that won’t make him uncomfortably hot. Also, when we arrive at a destination, we try not to do activities that will take us away from the RV for more than a few hours. Leaving him alone all day to stare at the walls isn’t good for any animal’s happiness. Plus, Wyatt has demonstrated his displeasure on more than one occasion. RVers who travel with cats have slightly more flexibility than dog parents. However many will still need to choose destinations and activities that won’t put their cat’s welfare at risk. That’s because even the most happy-go-lucky cat needs someone to check in occasionally. Unfortunately, finding a cat sitter in a new location can be tough. We call our RV the “Dog House on Wheels.” In a RV, dogs and cats own the living space. As an example, Wyatt loves to choose the most awkward places to chill out. He always trips us by laying on the floor in the kitchen area, or in the middle of walkway in our living space. Cats aren’t much easier. My full-timing friend keeps her two cats’ beds and perches all over the RV because cats are always happiest when they can survey the scenery. Pet fur and bodily functions require even more patience and understanding. When full-time RVing with cats (or if you just bring it along for a holiday), litter box RV modifications can be made before you hit the road or you’ll have a smelly RV. Dogs have more freedom to do their business outside. But you must always be at one end of the leash to scoop up the mess. Frequent walks and lot of care is essential to keeping your RVing dogs healthy. Our dog ate the Thanksgiving pies. If you have a chow hound or kitty with constant cravings, hiding food in your RV is tough. Dogs and cats always know when you stash things behind cabinets and doors. Recently on Thanksgiving, our dog Wyatt found pumpkin and pecan pies I had wrapped and placed on a shelf in our bedroom. He was so determined to get to them that he broke through the living area baby gate we use to keep him confined. 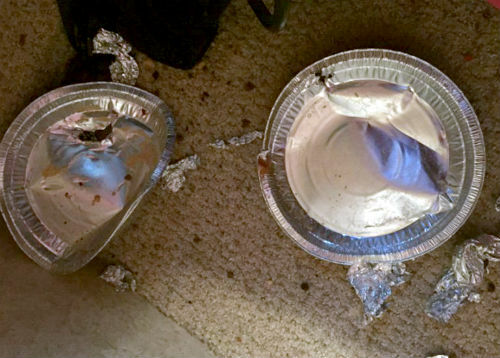 While we were eating Thanksgiving dinner at a friend’s RV, he devoured both pies and almost ended up in the hospital. Living with pets is difficult at times. But whether your a cat or dog parent, the memories you create together will always outshine any rough patches. That’s because animals teach us how to appreciate every moment, since they only know how to live in the now. When we follow this example on the open road, it makes every new adventure more meaningful than ever before. I have traveled and stayed in RV Parks with a dog. There are RV parks that don’t allow dogs or dogs over a certain size. If you plan to stay a while in a RV Park with your dog I would find a local Vet in the area. You should have any Vet and medial history available. If you dog hasn’t had a checkup lately make an appointment so the local vet can meet your dog and provide your pet with an examination. Older pets potentially can come down with ailments, it’s much easier for a vet who already knows your dog to perform diagnostics, Otherwise the vet may choose to put your unknown pet into a hospital where they have access to personal and lab test equipment. Pet hospital can be expensive … e.g. from around 250 to over 500 dollars a day. Next is find a place for you and your pet to exercise. Many dogs require at least some type of exercise every day. Secondly find a dog park if possible. 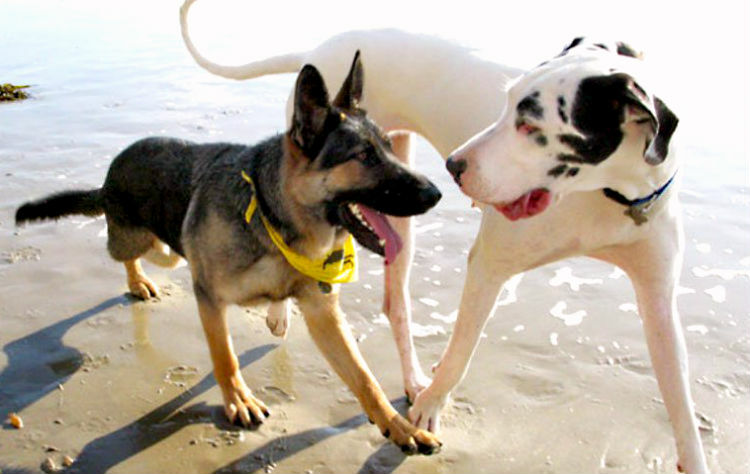 It’s important domesticated dogs are able to socialize with other dogs, If no dog park take your dog for walks in a public area where there are other dogs and pets. You can also take dogs for walks on the beach and forested areas, which is different from taking walks in a dog park and public areas, where hopefully your dog will be able to socialize with other humans, pets and dogs. When the times comes we’ll travel with more than one dog. That way they have each others company when one’s away from the RV. We keep looking what to get for our RV. I’ve come to the conclusion that some sort of toy hauler is the best. That way when on leaves the dogs at home they have a place to all their own and we don’t have to worry about then getting into some in the main living area. Only issue is 5th wheel toy haulers tend to have very high GVWR which in some states creating more of an licensing issue. We’re now looking at Newmar and Thor’s Class A toy haulers. If possible setup so you can watch, and hear, what’s going on when away using your smart phone. That’s way you can always check on the kids. Hey John – thanks for your ideas — especially about having a security setup (so many out there nowadays) that links back to your phone! Any cameras (think trail cameras) for ‘watching’ have batteries, so no power problems. Many have wide angle lens — you could even use a computer camera..
We have a devise called Vimtag. We set it up in our motor home and we can watch our dog from our iPhone when we are away. They are around $100 and well worth the cost. We are full-timing with two medium-size dogs. They love our small travel trailer. We got bunk beds, and the lower bunk contains the dog beds. That is their spot. They love looking out their own window. We find that it is fairly easy to exercise them, as we enjoy walking around small towns and exploring. The dogs come with us. If we plan to go someplace for several hours while the dogs stay in the RV, we just make sure they are tired. They love to sniff the ground to see who has been there before us. The more diverse the animal population, such as is found in natural areas, ensures they spend more time sniffing. Dogs use up a lot of energy when they are sniffing. Having dogs accompany us on our journeys adds to the fun. An incident that we laugh about is when a herd of bison crossed the road right in front of our Jeep, and then wandered right alongside the passenger side of our vehicle. The dogs’ reactions were something that we will remember for a long time. Anyone who RVs without a dog is missing out on some fun. Leslie I’m totally with you on that, dogs add so much to the experience! Agree, just getting started with a small dog that loves it when people travel across the states just to see her. We were out west in our class C when right down the middle of the road comes the biggest buffalo we have ever seen. My wife was driving and she says in a scared voice, what should I do? I said just stop and it will go around us. Sure enough it went to the side of the road and walked about a foot from our RV and kept going on past. Our two dogs at that time usually go nuts barking and jumping and running back and forth whenever they see any animal while in the car or RV. This time neither one barked or moved while watching the buffalo walk by us. That was the first time they ever saw a buffalo. After it was well past the back of our RV, the one dog made a soft short woof. I guess this way she can say she warned us as she should have. LOL. Yes, everyone should travel with their dogs or cats. I think they enjoy the trips as much as we do if not more. You won’t be worrying about how they are doing back at home or in a kennel while your on the trip. We have never kenneled any of our dogs. EVER. If they can’t go. We don’t go either. Happy Camping with your pets. Our dog predates our RV, I wanted a Lab, she wanted a poodle because of her allergies, and a toy sized because, well, I don’t know why. No surprise, she got her way, and having a ‘lap dog’ has worked out well for us. It’s a lot easier to live with a lap dog in a small house and a small Class A. Lays on the floor? Step over her. She doesn’t get into food or trash, but can’t reach a counter either. Small dog, less food and poo as well. Our poodles have been quiet dogs as well. When we’re stopped, the dashboard is her kingdom. ???? Because of her size, it’s easy to take her with us if we leave the RV, but we do have to be careful we don’t overdo walking her. Small dogs, especially our current teacup toy at less than 3 pounds, is sensitive to temperature extremes, so we’re careful about it, and a bee sting can be life threatening. After a scare at a rest area in WV, and driving like a crazed thing on the WV turnpike, we now carry children’s Benadryl with us in the RV. Might be wise for anyone with a pet I think. Thanks for the ideas with the cameras, I hadn’t thought of that, and I’m going to look into it. We travel full-time with a 12 Lb ragamuffin of a dog. We have stayed at more RV parks and campgrounds with hookups to keep our dog safe. We target not letting the interior temp get above 85 when we’re away. We even set up an iPhone with a thermometer in View to keep an eye on him and the temp while we were at a family function. Also, time of day his important and we target tours and hikes early on hot days. We love national and sate parks too. But it can be difficult to find hiking trails that our four-legged friend is allowed on. Some national parks are getting better, but most have a dogs can only go where cars can go policy. Finally, everybody, including you, need to keep your dog on a leash. Your dog may be well trained and never hurt a flea, but s/he hasn’t met our dog, who barks and doesn’t realize he is a 12-lb dog toy in the eyes of others. Been there. Done that. Please help! Good point on National Parks restricting dogs- we travel with 2 everywhere we go- we once went a good bit out of our way to go to Canyonlands. They do keep us from doing a lot since they can’t go on any walking trails in the National Parks- we knew that. We wanted to do the White Rim (motorized) Trail since we were in a 4wd. But it turns out dogs aren’t allowed even IN your vehicle! What a let down- we had no idea. Wouldn’t go without them for anything. You have a grammar typo in the ladt paragraph. ‘But whether your a cat or dog parent,’ Should be you’re, or you are. We worked in state parks for two summers with our LARGE lab/shepherd cross and 2-3 cats. Believe it or not, the worst thing I remember is when our poor little white, deaf, cross eyed female cat was stung by a bee….. she never saw or heard it coming, so she shrieked and we were almost in tears for her! We were able to leave the two A/Cs on low, when needed, and our 35′ motorhome had two wooden pocket doors, so there were a total of three rooms – very handy for separating a couple of our “kids”. Since the space was small (no slide outs in the ’95 Pace Arrow model we bought), it was pretty to keep it clean and smelling good, even with all of t hem. It wasn’t boring; one dark night one of our cats leaped out the door and shot up a nearby tree, with my husband hot on his tail! Mike caught him, then spent a few minutes trying to figure out how to get them both safely down…. which he did, from about 25′ up! Was full timing with two macaws. Every evening went went for a walk with one on my shoulder and the other on my hand. One evening a neighbor let out his two Rottweiler that came straight at me. They tried to knock me down by jumping against me and leaping for my birds. I held both above my head arms extended and started yelling. They kept coming. After what felt like forever and numerous sractches and bites the owner came out to retrieve his dogs. No by your leave or sorry. He thought it was funny. I have 5 parrots. One is a Scarlet Macaw and One is a Blue and Gold. My Yellow Nape Amazon could talk for hours on end. I could never bring any of mine camping because they are so loud. How to you keep them quiet enough? Mine even talk lowdly like they are trying to speak to their friends in South America or out talk each other. So sorry that the guy with the Rottweilers let his dogs out loose. Ours are always on a leash. I would love to be able to take our birds camping but I know they would not behave and we take our dogs so there would be no room for us. Our neighbors who take care of them at home spoil them rotten while we are gone so I think they love it when we go away. LOL. When we 1st started RVing we had 5 dogs. A huge Rottweiler Lab named Diesel, 2 mixed breeds medium size dogs 49 and 39 pounds Buddy and Sugar and 2 tiny Chihuahua’s 4 and 5 pounds – Tippy and Sugar. We had been on a road trip by car and had left the dogs in the care of my boyfriends live in son age 19. We had a wonderful 3 week trip from Georgia to Idaho Falls to visit my son while stopping at several National Parks along the way. I had done this years before when my son graduated from HS but I was so disappointed in how much the hotel prices had gone up. We checked out campground prices along the way because we both always wanted a travel trailer. The wonderful trip ended in horror when we came home to a total smelly disaster of a house. None of our 5 dogs were properly taken care of and the poor dogs had gone into the master bedroom closet to do their business when they had probably tried to hold it for 12 hours or more. We decided right them and there we were getting a travel trailer and taking the dogs with us. We figured that we probably would not have the greatest vacations because the dogs would be a pain to take care of. Stopping to walk them and pick up poop at the campgrounds. How could we drive across the country with 5 dogs in a car? My boyfriend came up with the best idea in the world. A diesel service van with a cage so the dogs had to remain in the back. Tons of room for the big dogs to be comfortable on their big travel beds and roomy crates for the Chihuahua’s which protected their beds and food bowls from the big guys. And so we prepared them with short trips. Then long day trips. The dogs loved it. We had to go to Savanna for a weekend wedding but we didn’t have the travel trailer yet. We decided to take the dogs to see if they would sleep in the van quietly while we stayed at a hotel. It would only be for 2 nights and it would give us an idea of how the dogs would do. It was October so we did not have to worry about heat or cold. We left early, walked the dogs often and got to the hotel & got ready for the rehearsal dinner. We had to go downtown and had to park in a parking garage. To our amazement the dogs never barked when we left or came back. They just slept. We walked them a lot then went back to the hotel. Even more to our amazement the dogs spent the whole night totally quiet. When we went out to get them in the morning there were about 6 young boys in the parking lot playing with a football. The dogs were not making a sound. When we opened the van doors and took out all 5 dogs one by one the boys were shocked and so were we. All 5 were sleeping away perfectly quiet and content. So we walked them for a long time to give them some exercise up till it was time to go to the wedding at a fancy country club. We were pretty sure this was not going to go so well. We’d be there for hours. My boyfriend snuck out to go have cigarettes every now and then and walked them and checked on them and they were fine. Again they spent the night at the hotel totally fine and the trip back home the next day was wonderful. And so we bought the trailer. Our camping dogs have been all over the country from our home in Georgia to Big Bend in Texas, Colorado as far west as Mesa Verde and from Florida to Acadia National Park in Maine with never an incident. They are always ready to go. They cannot contain their excitement when the trailer moves from the backyard to the driveway to get loaded. Since the van is Diesel we can leave the engine running when the weather is hot if we decide to eat in a restaurant while traveling or spend time on the overlooks snapping beautiful photos. The van has pop out windows so when camping in hot weather we put a fan in front to circulate air for them at night and a small electric heater in the winter. We have added a 2 seat back seat if we have another traveler with us. The van has broken down a few times so all 5 have been in the trailer just while it’s being fixed. They get rather annoyed at us disturbing their peacefulness stepping over them to walk in the trailer so they happily go back to the van when it’s ready. They enjoy the smells during the day, short hikes in the mountains, afternoons and evenings on the beach, meeting new friends everywhere and of course the nights around the fire and being with us 24/7. We lost Diesel at home at age 15 on August 2nd, 2016. We were at his side when he died. We lost Chico at age 14 & ½ at home on August 2nd, 2017. He died in my arms 15 minutes before my boyfriend got home from work. We adopted a 4 month old Yorkie-Chihuahua mix named Morkie in October of 2017. He has already been from Florida to Maine. We lost Tippy in Arkansas on the trip where we bought our 7 acre retirement property. She died in my arms on Saturday April 20, 2018 at 4:51 am. I was so grateful that she was with both of us and not alone at home. She had an adventure up to her last minutes of life. For now the dogs still spend their nights in their small camper van while we spend ours in our small travel trailer. Morkie wakes me up in bed every morning after my boyfriend walks him. He is so little and has to play a lot so he does spend a good amount of time in the trailer to play. It’s easy with him because he doesn’t shed. As we loose the older ones we will continue to adopt the smaller lightly or non shedding ones since we ourselves are getting older. I’m not sure if I could ever travel without any dogs. They add so much to the adventure and fun of every trip.